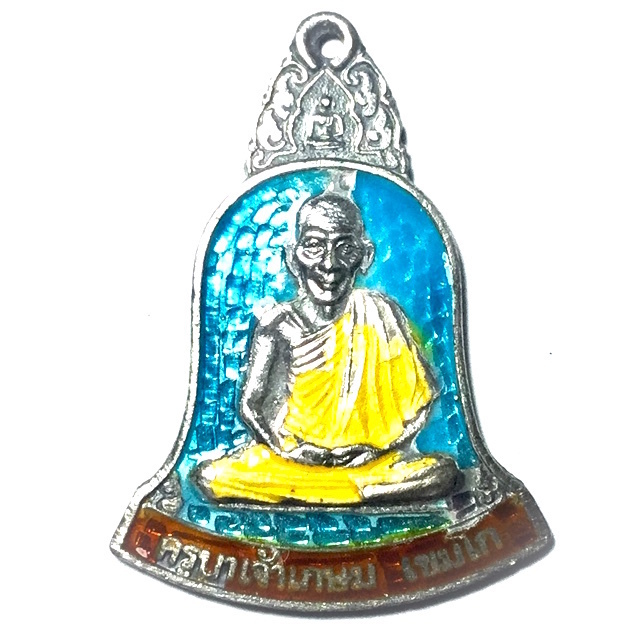 Rian Roop Muean Kroo Ba Kasem Nuea Ngern Long Ya Rachawadee Pim Song Rakang Hlang Pra Sangkajjai - Sawasdee Mee Lap Plord Pai Edition - solid silver with glazed enamels guru monk coin amulet released in 2538 BE at the Sussaan Trailaks forest Cliff Cemetery temple. Luang Por Kasem was a Master Guru Monk of the Lanna Tradition whose dhamma practice and renunciation is worthy of great reverence. Presumed to be an Arahant, His amulets are full of Puttanupaap (Buddha power of protection and fortune), because of the purity of this monk's practice. His meditative power and clarity of concentration used in blessing the amulets is that of an Adept practitioner. The front face of the amulet features the image of Luang Por (Kroo Ba) Kasem, with a Buddha floating over his head. The amulet has a hammered effect surface, glazed with Ya Rachawadee coloured enamel, and bears the words 'Kroo Ba Kasem Khemago' on the maroon red stripe of the bottom area of the coin. Below this is the Kata in Khom Agkhara "Sappē Chanā Sukhidtā Hōndtu (which means 'May i be Happy'). Below that, the next line of Kata Khom reads Mahā Lāpō Pawandtumē' (which means 'Bless me with Lucky Fortunes'). The third line of Kata below that reads 'Sappē Andtarāyō Wināssandtu' (which means 'all danger be eradicated)'. Below that, the next line reads in Thai 'Plord Pai' (meaning 'Safe'). Underneath this, says '30 January 2538' marking the date of the Buddha Abhiseka blessing ceremony of the edition's release date. The bottom line of Thai script curves around the lower edge of the bell shaped coin, and says 'Sussaan Trailaks Lampang' which is the name of the temple of Luang Por Kasem. LP Kasem is one of the few Master Monks whose power and sacredness is legendary on a Historical level, but whose amulets are still affordable compared to some other amulets of other top Gaeji Ajarn. His amulets have always been very popular with Thai people even during Luang Por's early years., for the purity of practice and massive faith which the devotees had in his Patipatā (practice). Even more so since many Devotees who wore Luang Por Kasem's amulets turned up constantly at the temple over the years, telling stories of great luck in commerce, love, as well as tales of miraculous escapes from fatal accidents, and lethal attacks from enemies. Many of these stories became National News stories, and the amulets of Luang Por kasem have long been the treasured protectors of military, navy, airforce and police officers, who consider his amulets to be very powerful Maha Ud Klaew Klaad Kong Grapan Chadtri magic. This edition is one of the many popular and sought after editions of amulets made by Luang Por Kasem, and is valued by collectors and "Sian Pra" in the professional amulet collector circles. Being solid silver version, the amulet is of course more highly preferred and much rarer, for its limited series. Most certainly yet another great amulet worth collecting and making Bucha to, for recieving the blessings of Metta, Kong Grapan, Choke Laap, Maha Sanaeh and Klaew Klaad that Luang Por Kasem's great purity endowed the amulets with when he blesses them. This solid silver coin amulet is an true masterpiece of miniature Buddhist Arts, with true old school class and style, and is a Pra Niyom Category amulet that is an immensely recommended for devotees of the Guru Monk Luang Por Kasem Khemago.